Summary: Gulf World Marine Institute, Inc. staff responds to live stranded sea turtles along the coast of the Gulf of Mexico in Florida Panhandle. GWMI will purchase a large animal scale that will not be damaged by salt water. This scale will be used to weight larger sea turtles that come into rehabilitation that do not fit on the standard scale that is being used at this time. Through this project, operations that benefit both State and Federal sea turtle program goals will be enhanced. 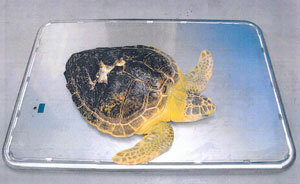 Results: Since purchasing the scale, GWMI has used the scale to weigh 10 turtles. A few of these animals were extremely large and would have previously not been able to be accurately weighed without using the marine mammal scale. With accurate reliable weights better treatment and correct medication administration has occurred.